So we’re a few days late, but better late than never...right? Since I was ordering online, I measure the dogs to ensure we got a good fit. What I didn’t take into consideration was that because Edison has a huge barrel chest, the rest of the hoodie would fall off his hinds. 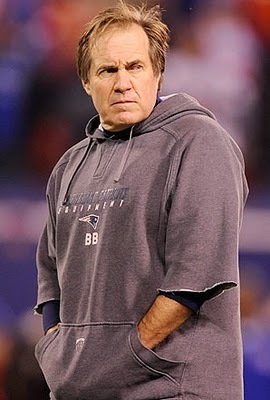 So that is how Edison came to be Bill Belichick for Halloween. Edison did great this year. We put him in a “down stay” when the kids came to the door. Only the first one startled him. This was particularly good for Ed since he tends to get overly excited when people come to the door. Tess, on the other hand, I had planned for months. I saw this on a BAD RAP dog a few years ago and thought it was the cutest thing. Dubbed as the "cowardly lion," it fit her personality perfectly. We handed out candy to the few bold trick-or-treaters that braved Sandy’s wrath on the East Coast. Unfortunately, we bought candy for the 100+ ToT’ers we usually get and this year got a whopping...15. Now we have a ton of leftover candy. Our co-workers are happy though. Hope you all stayed dry this Halloween!